Sadly little is known about Sidney Tucker. He was born in Yeovil in 1890. His father died and his mother, as Mary Jane Tucker (b1861, Yeovil), remarried bricklayer Henry Cridland Coates (1857-1925) at Yeovil in the spring of 1908. In the 1911 census Henry and Mary were living at 6 Wellington Street with five of Mary's children by her first marriage (all keeping the surname Tucker); Bert (b1889), 21-year old Sidney, Alfred (b1892), Alice (b1897) and William (b1900). Sidney gave his occupation as a monumental marble mason. When war broke out Sidney was in Canada and enlisted there, joining 1st (Western Ontario) Battalion of the Canadian Infantry. His Service Number was 412954. The 1st (Western Ontario) Battalion was a battalion of the Canadian Expeditionary Force and was created on 2 September 1914 with recruits from 'Military District 1' which was Western Ontario. The battalion set off for England on board the SS Laurentic, a British ocean liner of the White Star Line, berthed in Quebec. They arrived in England on 14 October 1914 with a strength of 45 officers and 1121 men. Training and reorganization commenced upon arrival in the United Kingdom. The battalion became part of the 1st Canadian Division, 1st Canadian Infantry Brigade and it was not until 26 January 1915 that the division was officially organised. The 1st Canadian Division saw its first major action in the Second Battle of Ypres, 22 April-25 May 1915. This was a rare German offensive on the Western Front during 1915. It was launched with two aims in mind. The first was to distract attention from the movement of German troops to the eastern front in preparation for the campaign that would lead to the victory of Gorlice-Tarnow. The second was to assess the impact of poisoned gas on the western front. Gas had already been used on the eastern front, at Bolimov (3 January 1915), but the tear gas used there had frozen in the extreme cold. At Ypres the Germans used the first lethal gas of the war, chlorine. The gas was to be released from 6,000 cylinders and would rely on the wind to blow it over the allied trenches. This method of delivery controlled the timing of the attack – the prevailing winds on the western front came from the west, so the Germans had to wait for a suitable wind from the east to launch their attack. The line around Ypres was held by French, Canadian and British troops. The attack on 22 April hit the French lines worst and, not surprisingly, the line broke under the impact of this deadly new weapon. The gas created a gap 8,000 yards long in the Allied lines north of Ypres. The success of their gas had surprised the Germans who didn’t have the reserves to quickly exploit the unexpected breakthrough, allowing enough time to plug the gap with newly arrived Canadian troops. During the battle the British, French and Canadians suffered 60,000 casualties, the Germans only 35,000. The Battle of Mont Sorrel was a local operation in the Ypres Salient, near Ypres, Belgium, from 2 to 14 June 1916. The battle took place on the high ground of the Ypres ridge at Mount Sorrel and the double summits of Hill 61 and Hill 62 (Tor Top) which formed the 1916 British Front Line south-east of Ypres. This sector of the Line was held by three divisions of the Canadian Corps. In an effort to pull British resources from the observed build-up in the Somme, the German army attacked an arc of high ground positions, defended by the Canadian Corps, including 1st (Western Ontario) Battalion and Sidney Tucker. The German forces initially captured the heights at Mount Sorrel and Tor Top before entrenching on the far slope of the ridge. Having lost the high ground on the first day of the attack, the Canadians put up a determined fight to recapture the ground, which they did for the most part after 13 days of fighting. Following a number attacks and counterattacks, two divisions of the Canadian Corps, supported by the 20th Light Division and Second Army siege and howitzer battery groups, recaptured the majority of their former positions. Casualties on both sides were heavy. The Canadians suffered just under 8,500 casualties; of those 1,000 men were killed and another 1,900 were missing. The Battle of the Somme opened on 1 July 1916, the worst single day in the history of the British Army, with over 19,000 British soldiers killed and 38,000 wounded. However, the Canadians' part in the great battle, which was to last through to November, did not begin until September at Pozières, and lasted through to October. The Battle of Pozières, 23 July to 3 September 1916, was a two-week struggle for the French village of Pozières and the ridge on which it stands, during the middle stages of the 1916 Battle of the Somme. When the Australian ordeal on Pozières ridge was over in September, they were replaced by the Canadian Corps who held the sector for the remainder of the battle. Sidney Tucker was killed in action on 9 September 1916. He was 26 years old. 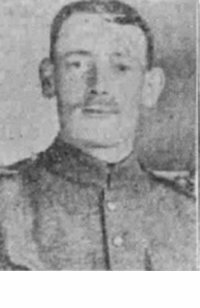 In its edition of 6 October 1916 the Western Gazette reported "News has been received by Mrs Coates, of 6 Wellington Street, Yeovil, that her son, Private S Tucker, of the Canadian E.F., was killed in action in France on September 9th. When war broke out he was in Canada and enlisted in Canada and crossed to England, going to France nine months ago. He was much esteemed by all who knew him, and many will regret to hear of his early death. The deceased soldier was 26 years of age. Much sympathy has been expressed with Mrs Coates in her sad loss." Sidney Tucker was interred in Sunken Road Cemetery, Contalmaison, Somme, France - Grave I.D.12 and his name (albeit only as 'S Tucker') is recorded on the War Memorial in the Borough. 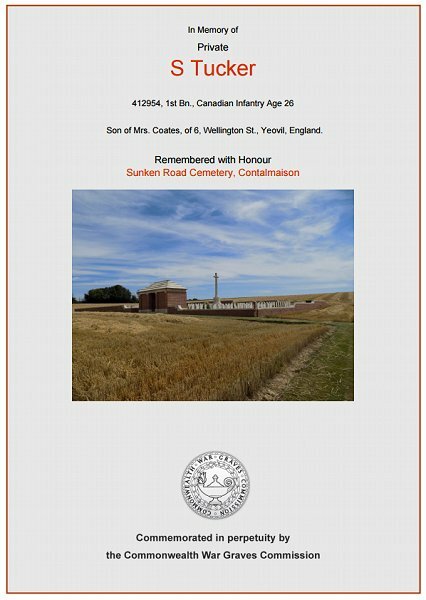 The Commonwealth War Graves Commission certificate in memory of Sidney Tucker.